In this age of instant access to networking platforms like LinkedIn, we can connect with like-minded people with a simple click. However, it doesn’t quite compare to the relationships that can be formed and opportunities that can arise from networking at an event such as The Sporting Heritage, Photography and TV Conference. Celebrating our sporting heritage and the media surrounding is important for developments in sporting media’s future, as are developing relationships between industry professionals. Collaboration is the foundation for innovation, but by looking back at our sporting heritage we can learn from our mistakes and triumphs, allowing us to explore new ideas to create the future of sporting media. Speakers at the event included University of Bristol’s Professor Mike O’Mahony, and Wimbledon Lawn Tennis Museum’s Collections Manager Anna Spender, who both brought up excellent points about the accessibility of museum collections to the next generation of sporting media industry professionals. 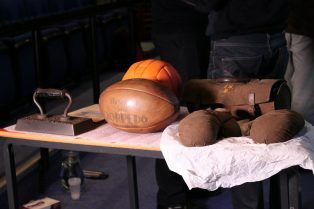 Sporting relics that tell the story of our sporting heritage like Wakefield Museum’s Playmakers collection inspire us to contribute to the industry, and support the education of those who desire a career in the industry. As a final year student studying Media Technology and Production, I greatly appreciated the detailed history of technological advancements made to capture major sporting events through the years told by guest speakers, and how these advancements have influenced the sports themselves. It provides great food for thought, and I am grateful for Sporting Heritage giving me the opportunity to photograph the event!